The Aaron Smoke Shark is designed to be easy to use and extremely effective at smoke and particle removal at the operative sight. 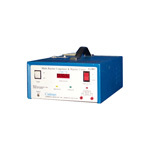 While designed for use with all electrosurgical generators, it is also excellent for use in controlling laser smoke. A variety of accessories are available to customize the Smoke Shark to your specific application. These include laser-resistant tubing, tubing reducers for attachment to smoke pencils or vaginal speculum, many other tubing configurations (sterile or nonsterile), a foot control and a remote switch activator. Never again order the Smoke Shark and still need to order a filter upon receipt, the SE02 is packaged with both the SF35 Extended-Life Filter and FSSEP Pneumatic Footswitch. The SF35 Extended-Life Filter offers up to 35 hours of performance reducing procedure cost by 38%(+/-) from the previous model, when used at the lowest setting. AORN recommends the use of smoke evacuation systems during any medical procedure producing surgical smoke. 500,000 healthcare professionals are exposed to surgical smoke proven to carry viruses, CO, and other chemical and biological hazards. The Smoke Shark II minimizes exposure to these toxic smoke plumes during electrosurgery, laser, and harmonic scalpel procedures. The Extended-Life Filter (SF35) offers up to 35 hours performance reducing procedure cost by 38%(+/-) when used at the lowest setting.